KETO//OS Max Vanilla Ski is the latest flavor to be cooked up in the Pruvit lab and is now available for a limited time via the online store! Pruvit has already released so many delicious flavors this year, and being one of the most requested fan flavors, vanilla has finally made the cut. But much like the tasty grape Purple Reign flavor, this one will also be a limited release until further notice. KETO//OS Max Vanila Ski contains the patented MaxBHB ketones as well as C-Med 100 (DNA Repair), B Vitamins, BCAAs, and comes in a caffeine and caffeine-free option. 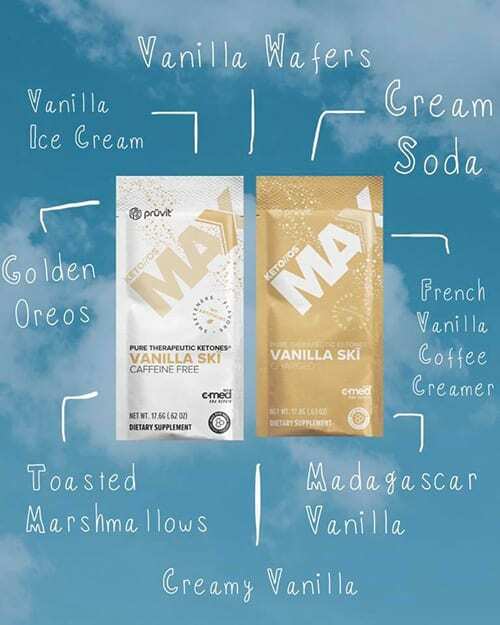 Those who have already had a chance to taste MAX Vanilla Ski are describing the flavor in the following various ways; vanilla wafers, vanilla ice cream, golden oreos, cream soda, french vanilla coffee creamer, toasted marshmallows, madagascar vanilla, and creamy vanilla. I’m already excited about making homemade keto vanilla ice cream with the new MAX Vanilla Ski! How about you?